TV on the Radio dropped by the Knockdown Center in Queens to celebrate the 10 year anniversary of their landmark album Dear Science for a special one-off performance of the record played from beginning to end. 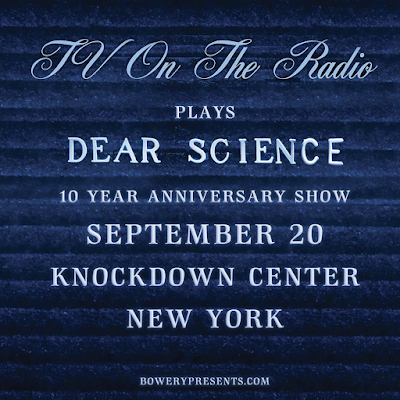 In the ten years since TV on the Radio released their phenomenal third record, Dear Science, the indie rock landscape has been flipped on its head. These days, the idea of guitar based indie rock no longer packs the same punch as it did in 2008, and the notion of "art-rock" seems all but lost to the past. However, a decade ago, TV on the Radio were the forefront of a rising scene and while Return to Cookie Mountain will go down as their masterpiece, Dear Science is the album that escalated the band to the top of festival posters and saw their influence reach a wider audience than anyone could've expected. In the first decade of the new millennium, New York was back in the spotlight as the home of new, groundbreaking music. It was a time when mainstream rock had its lost soul due to the exploitation of grunge and rap-rock was the new face of MTV. Shortly after the Strokes kicked down the door and ushered in the revival of rock and roll, other New York bands were pushed to the front and helped establish the new cool. Following their peers in the Yeah Yeah Yeahs and LCD Soundsystem, TV on the Radio were the avant-guard extreme to the straight-forward, guitar epic anthems that the Strokes had accentuated with Is This It?. Over the course of an EP and two full-length recordings, the band found themselves in front of their largest audience to date and the anticipation of their third record was looming. 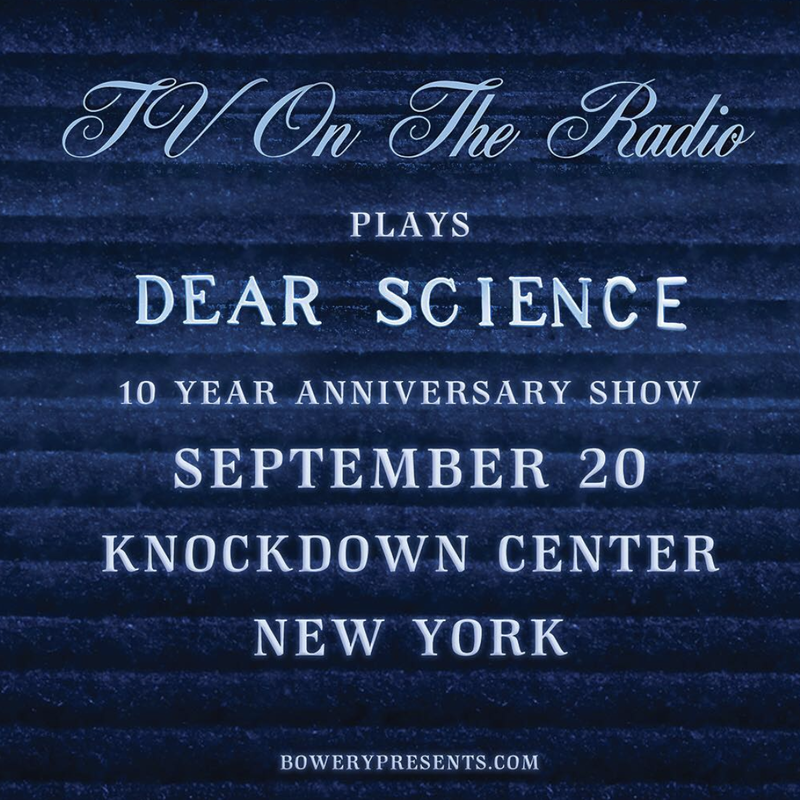 When Dear Science dropped in the second half of 2008, it broke down the barriers that their earlier work had put up and was, without question, their most immediate and accessible music to date. A decade later, not only does the album still hold up as some of their strongest work, but hearing these songs played again in a live setting feels just as powerful and invigorating now as it did a decade earlier. Kicking it off with "Halfway Home" and never letting go of their impressive energy, the band made these songs come to life in a whole new light. Their charisma was off the chart and they sounded as if this was the first time these songs were being played live before a real audience. There was never a sense of boredom or a feeling that these songs have been kicking around for a decade. It felt fresh and alive with passion, never once did the band seem to compromise their aesthetics for the live setting and each track sounded fruitful and even better than the recording. Watching Tunde spit rhymes and run across the stage during "Dancing Choose" was inspirational, his power over the audience unwavering. It was a transcendent moment that only progressed to new heights as the night carried on. "Family Tree" was as emotional as one could expect and instantly brought the crowd to their knees before the buzzing intensity of "Red Dress" brought things back up to 11. "Shout Me Out" and "DLZ" continued the journey and really hit home at how much this record really amplified the grooves in their music. The funkiness of their guitars never sounded so ready for the dance floor until this album and watching the crowd go crazy all night only helped to prove that point. "We recorded this song in the studio, but we never got to play it live" Kyp Malone announced as the band ended their set with a stunning performance of "Lover's Day." Hearing the live debut truly felt special and was a tremendous end to a remarkable record. For the encore, the band kept it classic. "Starring at the Sun," into "Wolf Like Me" was absolutely brilliant and perhaps the pinnacle of the night. During the later song, people in the front finally broke and started a dance circle resulting in of the highest energy moments of the entire show. Sometimes it's easy to forget just how great these songs are and how much this band changed the way I heard music, but watching them live brought back an instant rush of nostalgia. Closing things out with "Satellite" continued the streak of sticking to nothing but the classics (every song played was from a prior decade) and true fans couldn't ask for a better finish or night in general. It was a night of real perfection. Every moment felt spot on with nothing falling out of place. "Magic is real" uttered Kyp during the encore, and for just over an hour, nothing felt more true than that. 12 "Staring at the Sun"